Trfiles are one of those great little desserts that don't get nearly enough attention. Actually, most people I know had no idea that's what these are called. 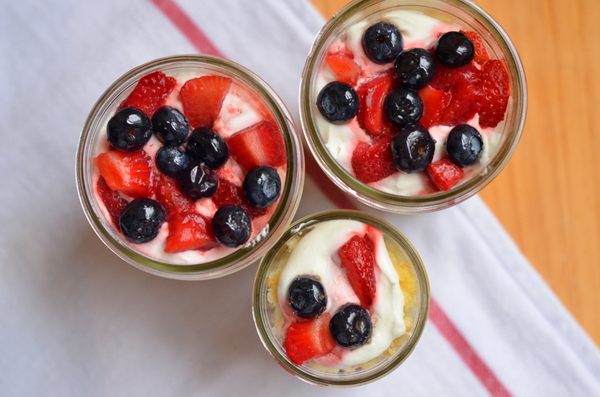 They're great though, simple, light, sweet and easy to change up to fit with whatever is seasonal or handy - that's a recipe for a great summer dessert in my book. I used this recipe for Classic Yellow Butter Cake from The Sisters Cafe blog (if you've never made cake from scratch just trust me and make this cake! It's pretty simple, not to mention even better then a box mix - I promise! ), my go-to recipe for Homemade Whipped Cream (scroll to the bottom of the post for the recipe), and strawberries and blueberries I let macerate in a little demerara sugar for about a half hour. Make the cake in a long sheet tray (you might need two for reglar size trays), let cool and turn out of the trays onto parchment paper. Using cookie cutters (or mason jar lids if you're doing them in a mason jar) cut round of cake out and add to the bottom of your jar, layer with a heaping spoonfull of whipped cream and fruit and repear until your jars are full, ending with fruit.